My tandem buddy Clinton and I visited the Sa Pa region during my tandem challenge. Clinton and I decided to go on a Minsk Motorbike adventure from Hanoi to Sa Pa and back. At that time I was still looking for a charity to support in Vietnam. So we went and discovered that the café and the hiking tours they organize are there to support the tribe people from the region in their education. We were invited to attend a class with the kids and spent a morning with tribe kids of all age helping out during english and math classes. The motivation of the children was just incredible. They were all very active and eager to learn. Many of them don't speak english or even Vietnamese so most of them end up selling stuff to tourists in the streets of Sa Pa.
English reading exercise that went very well. Good student! 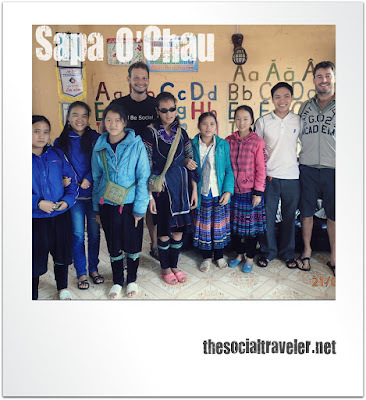 If you want to learn more about the Sapa O'Chau project you can visit their website here. They definitely deserve support since it gives these kids the chance for a better education and with it a chance for a better future. We are currently looking to donate a part of the money raised during the Cycle for Charity event organised by +Melanie Djiauw . Get in touch via the comments below or via one of the social networks I use. I'll write a post about your initiative and share it with 12.000 Friends and Followers from around the world to help you reach out to more people. The money raised will be donated by you as an organizer DIRECTLY and IN FULL to Sapa O'Chau.